Roku scored two new partners in its quest to rule the living room: Best Buy’s Insignia brand and Haier will both joining the list of TV manufacturers using Roku’s smart TV platform in 2015. This indicates that Roku continues to bet on bargain-priced TVs for budget-conscious consumers. But with future 4K support, Roku is also gearing up for higher-end devices. [company]Roku[/company] announced its first Roku-powered TV sets at CES in Las Vegas last year, at the time signing up [company]TCL[/company] and [company]Hisense[/company] as its first consumer electronics partners. Now, [company]Best Buy[/company] is throwing its hat in the ring as well. The retailer will be starting to exclusively sell Roku TVs made under its Insignia in-house brand this spring. [company]Haier[/company] will start selling its very own Roku TVs in Q3, with screen sizes ranging from 32 to 65 inches. The company will also continue to sell so-called Roku-ready TVs, which are essentially just regular TVs with a bundled Roku streaming stick. 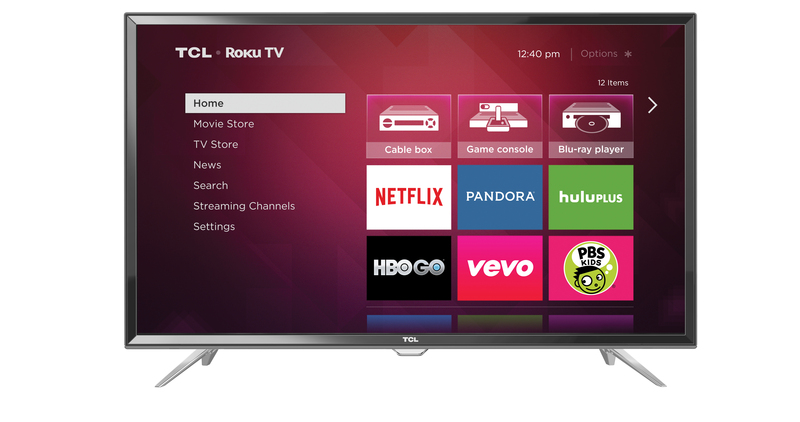 Roku TV launch partner TCL is also back for more: The company will announce twelve new Roku TV models this spring. A Roku spokesperson wasn’t able to provide any further details on features and screen sizes, but a recent FCC filing suggests that at least one of these devices will feature a 55-inch screen size, and go by the model number 55FS3700. That TV, as well as the other eleven the company is set to announce, will all feature regular HD resolution, but TCL is also the first partner to commit to Roku’s forthcoming 4K support. Roku is announcing a reference design for 4K at CES, which TCL and others can use to build their own 4K-capable Roku-powered smart TVs. Roku SVP of Product Management Jim Funk told me during a recent interview that Roku-powered 4K TVs will be able to play 4K content from Netflix and other yet-to-be announced streaming partners. Funk didn’t want to commit to a firm date for 4K Roku TVs, but said they’d likely not be available in the first half of this year. Funk also declined to comment on whether Roku plans to make 4K-capable streaming boxes. 4K was supposed to be a big deal last year, but failed to really take off due to limited content. However, Funk was optimistic that this will change in the long run: “I have no doubt 4K will be a successful format,” he told me. Hopefully, before these TV’s come out, Roku and Amazon Prime will fix their app issue that has been plaguing users for the past month or else there will be no more customers wanting Roku products…. Error 012.